Prepare pudding as it says on package. Coarsely chop your 10 cookies. 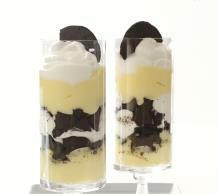 Make two layers of vanilla pudding, chopped Oreo cookies, and whipped cream in 3 tall glasses. Top with remaining chopped cookies.